Tim Holtz, one of my heroes, used to do a 12 tags of Christmas, but he recently changed his format to 12 tags of 2012, featuring a tutorial once a month on his blog. Last month was the Valentine's tag I did here, and this month, he upped the ante by doing a faux mosaic effect. I followed as closely as I could with the materials I have. 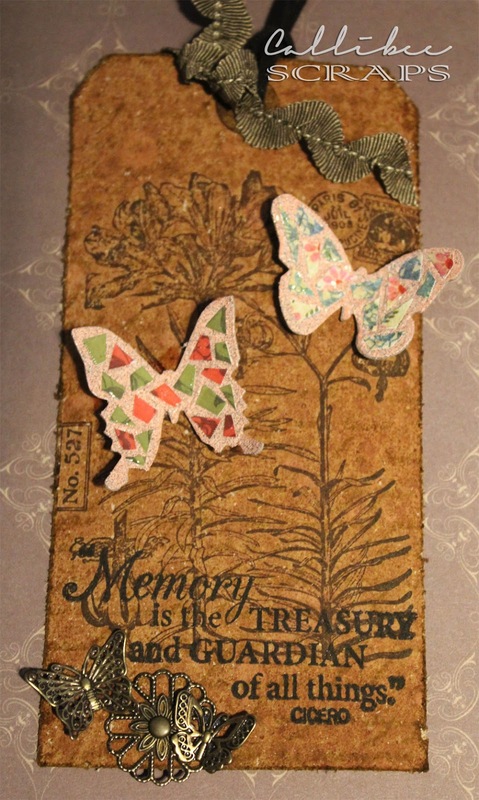 I wanted to use a brighter "grout" for the butterflies just to give it the contrast and I love the Inkadinkado flower stamp on the background. This was a quick fifteen minute project but the possibilities with the mosaic effect is endless and you can adapt the technique to any die cut shape to give it that amazing look. I love your tag! Great background and your mosaic butterlies are lovely. I love the use of the metal butterfly and flowers.